At some stage in the months to come, MPs are going to be asked to vote on legislation to allow the UK to leave the EU. How should they vote? 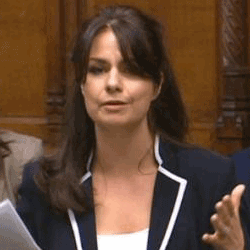 In my opinion, the issue brings us to the fundamental question of who an MP represents. I want an MP who represents the views of their constituents, but I recognise that there are other views on this. Many, particularly on the left in my experience, believe that an MP represents the party to which they belong, and should always vote to support that party. They say that voters understand this when they vote for them. Others say that this is a representative democracy, and that we are simply electing someone to make the best judgement they can on each issue as it arises; they want an MP to vote with their conscience. I believe that the people who voted ‘remain’ in the referendum do not expect their MP to automatically acquiesce to a national sentiment. SNP politicians who lost their referendum did not do so; they resolved to continue the fight, and were richly rewarded at the ballot box. 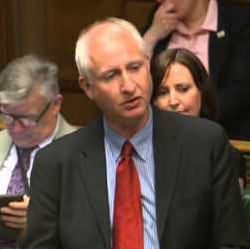 It seems to me that both MPs, especially Mr Zeichner, should continue to fight for continued EU membership in any way that they can, unless they genuinely believe that a national referendum outweighs any local considerations. This includes voting against leaving the EU in parliament. Certainly that’s the path MPs in Scotland will be taking. This, I have to say, is disappointing. I am not suggesting that parliament as a whole should refuse to vote through legislation on leaving the EU. Each MP should weigh up the importance of the considerations which I’ve outlined above, and I suspect that if they do so, the leave legislation will be passed. But in the case of our two local MPs, I would hope the fight will continue. If it does not, it’s because they believe that the responsibilities marked ‘Leave’ above outweigh those marked ‘Remain’. In the case of Ms Allen, it means that she considers the national result, and perhaps the views of local party members, to be more important than what her constituents want overall, and probably even what the majority of the 31,454 people who voted for her want. And that’s a very serious statement from them about who they represent. 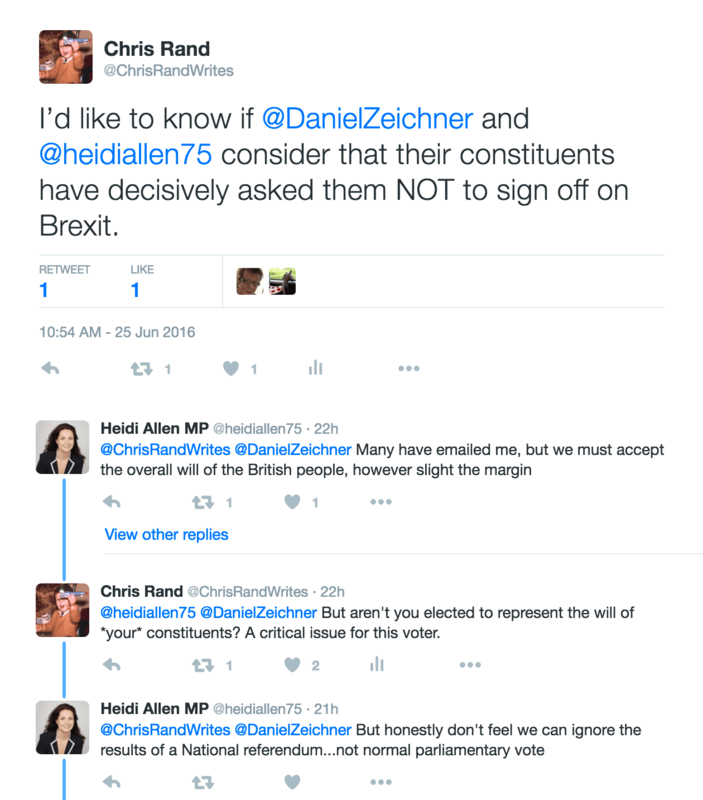 Addendum: It’s been pointed out to me that Ms Allen will be one of the very few Conservative MPs who have a mandate from their own constituency to continue the fight for EU membership. An even fewer number of Conservative MPs (I’m struggling to find any others, to be honest) will probably have a mandate from those who voted Conservative in their constituency. I suspect that people across the country will be looking to her not to waste that opportunity. Let me be clear. 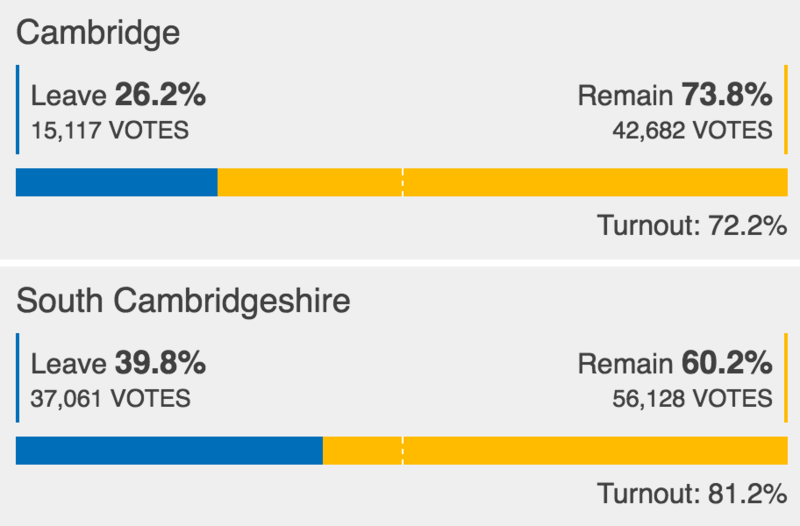 When the vote on the EU comes before Parliament, my vote will reflect the overwhelming result in Cambridge – to #REMAIN. *Do the maths; at the general election, the votes here in Ms Allen’s consituency were 50% Conservative, 10% UKIP, 40% Others. At the referendum, the vote was 40% ‘Leave’. If we assume that all 10% of the UKIP voters went for ‘Leave’, and 20% of the Labour, LibDem and Green voters joined them (forming another 8% of the total), then the 50% of voters who supported the Conservatives must have provided 22% to the ‘Leave’ vote and 28% to ‘Remain’. For the Conservative vote to have favoured ‘Leave’ would have required 90% or more of Labour, LibDem and Green voters to have voted ‘Remain’, which seems unlikely.